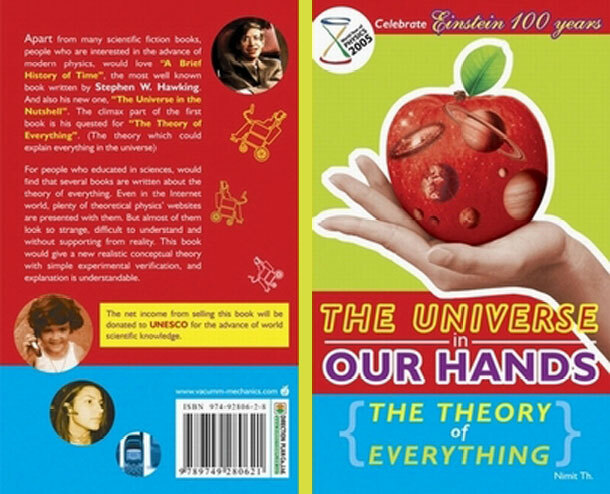 1) " The Universe in Our Hands (The Theory of Everything)" is the title of the book. It is the easy version of the original article "Vacuum Mechanics a New Approach to the Theory of Everything", and it was written for general people who love the advance of modern sciences. 2) To celebrate 100th Anniversary of Albert Einstein's Miraculous Years with UNESCO for World Year of Physics 2005. The net income from selling this book will be donated to UNESCO for the advance of world scientific knowledge. Now the book can be free download via pdf file. .....What will be talked about in this book is what I had written in the scientific paper "Vacuum Mechanic a New Approach to the Theory of Everything" (which is now presenting in the website www.vacuummechanics.com). It is a new theory proposed to solve the problems in the modern theoretical physics. The story in the paper is quite interesting, but it is quite difficult to understand for people who do not work in this field. So I would like to share the idea to scientific minded people (like you), who are interested and want to get it easier. .....It is expected that you have read "A Brief History of Time" and "The Universe in the Nutshell ", the well known scientific books written by Professor Stephen W. Hawking. In the first book, what about his quested is to find the theory of everything, which is the final theory that could explain every natural phenomenon in the universe. In this book, we would found that it is possible to do so, and then let us come to explore it together and see how it could be done. .....Finally, to celebrate 100th Anniversary of Albert Einstein’s Miraculous Years with UNESCO for World Year of Physics 2005. What I would like to do is; first, to completing Einstein theories of relativity (in this book) which was criticized to born with many side effects from philosophical problems. And also to fulfill his final dream for unifying gravity with electromagnetism. Second, to promote the knowledge of contemporary (modern) physics for general public especially youngsters. (And today we know it is not easy to do so. The reason is almost all of modern physics are so strange, unnatural and difficult to understand why it is something like that!) Third, the net income from selling this book will be donated to UNESCO for the advance of world scientific knowledge. 1.1 Sir Isaac Newton and the apple. 1.2 James Clerk Maxwell and mobile telephones. 1.3 To stay young with Albert Einstein. 1.4 Einstein and black holes. 1.5 Quantum Mechanics a mysterious theory. 1.6 The final theory of God! 2.1 Einstein and the apple! 2.2 The magic waves of mobile telephones! 2.3 Could we really stay young with Einstein? 2.4 Curve space of nothingness! 2.5 Quantum mechanics with ghost waves! 2.6 Could we found God's final theory? 3.1 The miracle of nothingness! 3.2 One more (sweet) dream please. 3.3 When dream comes true. 3.4 Black hole and the apple. 4.1 Billions of black holes. 4.2 When black holes were tamed! 5.1 Here comes Galileo Galilei! 5.2 H. A. Lorentz a hero in the back screen. 5.3 The return of Newton! 6.1 Curve space of something! 6.2 The universe of nothingness! 7.1 Quantum mechanics with God waves! 7.2 Quantum and Relativity could be married now! 8.2 Animals in God's zoo! 8.3 The mercy of God! .....Up to now, we come to the final chapter. Let us conclude what we have done in the past chapter 1 to 7. First, we started with dream of mankind, which tried to understand the way of nature. And this leads to the creation of physics (science of nature) theories. For the early physics theories, we found that they are simple, intuitive and understandable. When time has gone, modern theories of physics are so strange, non-intuitive and cannot be understood why it is something like that. Later we have point out problems in those theories. Then we proposed a new concept – vacuum mechanics, and shown how to solve the problems. Here we come to the final part of the story. And the heaven gate is opened to the theory of everything. So let us complete our story together as below. .....In conclusion, we could touch the theory of everything as follow. We start with that our universe was created out of vacuum medium (gravity). While the universe is expanding, electrons and protons (small black holes, the only two types of elementary particle) were formed from the condensing of vacuum medium. The attraction between the protons in the nucleus and the circulating electrons is an example of electromagnetic force. But if electron and proton are forced to stick together (weak force), neutron is created. Also nucleus of helium atom is created when two protons and two neutrons are forced to stick together (strong force). These are the creation process of matter from energy. And we know that all kind of matters are composed of electrons, protons and neutrons. Also we know that all plants and animals are born from the same kind of these particles. Then everything in our world could be understood. .....How about something outside our world? Up to now, we know that matter in all planets in our solar system have the same kind atoms as our world do. Indeed, scientists who are involved in this mater have proved that, this concept extends to all stars of all galaxies in our universe. So in conclusion, this should be the theory we dream for -- the theory of everything! And all these things were the appearance of the mechanism of vacuum medium. Then it should be classified as a new field of physics -- vacuum physics -- because it is something that we have never heard or seen before. But it gives us a really new idea and it lets us understand the whole of our universe. So maybe we could call it as physics of God!